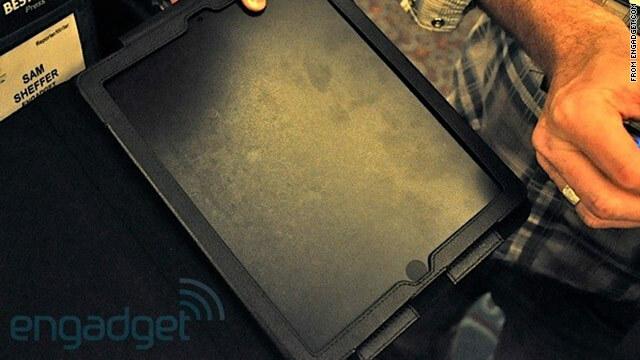 A blogger for Engadget spotted this case for the iPad 2, which its maker says was based on guessed specifications. Las Vegas (CNN) -- Tech-heads are drooling over the prospect of a second-generation iPad, widely expected to be unveiled in the next month or so. So when a blogger at Engadget spotted an apparent case for the iPad 2 here at the Consumer Electronics Show, he wrote about new features that may be found on the device. Most notably: A front-facing camera, which could be used to video conference. And a slightly different size. The only problem: The case's specifications were based on guesses about what the new iPad might be like, not inside information from tight-lipped Apple, according to the company that made the case. "I think we all know -- just like the iPhone -- there's going to be another version [of the iPad]," said Patrick Tarpey, spokesman for Dexim, which briefly displayed the case. Dexim doesn't know what the new iPad will look like, he said. It based the prototype on rumors that have been, like usual, circulating on blogs. "It's almost just a guess," he said of the design. Dexim pulled the case from its booth at the Consumer Electronics Show after it was reported that it might have been designed for the iPad 2. The company declined to show the case to CNN. "It was a single model. We weren't really saying this was a possible iPad 2 case," he said. History suggests Apple could announce a new generation of the iPad later this month, since that's the time frame it followed when it revealed the original iPad. The company typically sticks to pretty uniform announcement schedules. And it rarely if ever releases information about its upcoming products until a formal announcement event. As far as what the new iPad will look like? No one really knows for sure.